Get the entire Kingdom Hearts saga (pre-III) for $39.99. 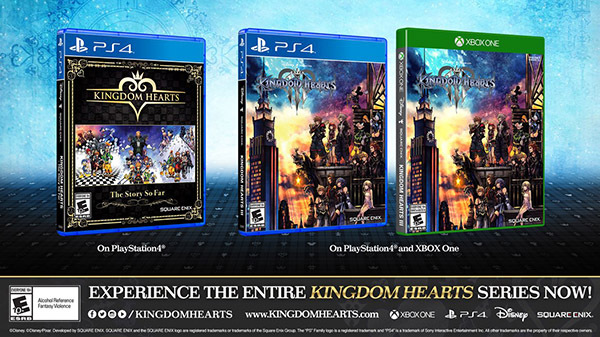 Kingdom Hearts: The Story So Far, which has been sold out following its initial release in the United States in October 2018, has returned to U.S. retailers such as Best Buy and GameStop, and will launch in Canada and Latin America on March 15, followed by Europe on March 29, publisher Square Enix announced. In Kingdom Hearts: The Story So Far, Keyblade wielders can relive the magical adventures of Sora, Donald Duck, Goofy and friends as they attempt to stop the Heartless invasion that threatens their universe. Fans will travel to iconic Disney locales and join forces with beloved Disney and Final Fantasy characters in order to fight back against the threat of darkness and bring back light to all worlds. Kingdom Hearts: The Story So Far is available for PlayStation 4.